The Academic Advising Center (AAC) is the advising office for the College of Liberal Arts and Sciences (CLAS). The AAC provides several advising services for CLAS students, exploratory students, Pre-Health and Pre-Law students, and other students interested in CLAS majors. We are typically open for advising from 8:00 – 11:30 a.m. and again from 1:30 – 4:30 p.m. The wait list for seeing an advisor can fill up, so please try to arrive early, especially during busy periods. Students can see the wait time on our homepage. Our office will close occasionally for University business and students are welcome to call our office to check our walk-in hours for the day. We are located in Farrior Hall on Fletcher Drive. We are across from the Student Health Care Center and Racquet Club. You can find us on the campus map by typing in AAC. 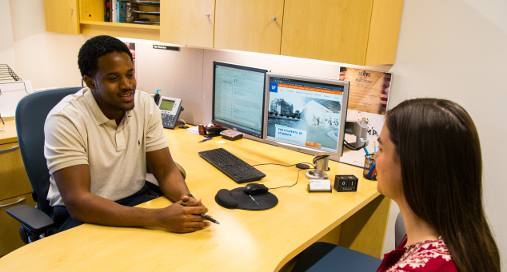 Most CLAS students see an advisor on a walk-in (first-come, first-serve) basis. To see an advisor, please sign in at the front desk in the AAC. Please note that at certain times of the year a large number of students may attempt to receive academic advisement at the same time. Individual advising sessions are available by appointment Monday through Friday, 8:00 – 11:30 a.m. and 1:30 – 4:30 p.m. To make an appointment with an academic advisor or a Pre-Law advisor, please sign-up in the front lobby of the AAC or call (352) 392-1521 ext. 0 at that time. Please note that we do not make appointments during peak times such as drop/add and advance registration. This allows the AAC to serve the maximum number of students each day. Please note that if you are more than 5 minutes late to your appointment, it will be cancelled and you will be asked to sign in as a walk-in. To make an appointment with a Pre-Health advisor, please call (352) 273-4083. During non-peak times, phone advisors are typically available Monday, Tuesday, Thursday, and Friday 8:00 AM – 10:30 a.m. Please call (352) 392-1521 ext. 0 and ask to speak with a phone advisor. Phone calls are answered on a first call, first served basis. Please note that some requests may only be made in person. We do not remove holds or change majors over the phone. Staff emails are not provided on this site. In order to provide timely responses to inquiries our advisors monitor team email inboxes. You may email a question from our email page for answers to general questions about the College of Liberal Arts and Sciences. We strive to answer all e-mails within 24-48 business hours. However, there might be a delay in response during peak times. Come in early in the morning or just after 1:30 p.m. Please note that we stop seeing students at 11:30 a.m. and again at 4:30 p.m. We will ensure that all students who have “signed in” are seen before we leave for the day. To be able to do this during very busy periods, we may close the sign-in list early. The number of students seeking academic advising in the AAC dramatically increases as we approach advance registration. Help you understand your degree requirements (and show you how to read your degree audit). If you are confused by your degree audit, or think it is incorrect, we can help you understand or correct it. Discuss your tracking requirements (what you should be doing to stay on track). A number of students will have Universal Tracking holds because they are not progressing in their major. We can help you determine what you need to do to get back on track, or help you identify your options if you need to change majors. We do not lift holds through phone or e-mail advising. Determine why a College hold has been placed on your record (and what you need to do to resolve it). CLAS places holds on students who are on probation as well as students who are not meeting college progression standards. We do not lift holds through phone or e-mail advising. Explain placement and prerequisites for the courses you are thinking of taking next term. A number of courses require placement (readiness assessments or SAT II exams) or have prerequisite courses that must be completed or in progress to register. Help you identify your options if you are having difficulty THIS semester. Often, dealing with a problem as it is beginning will prevent the worst from happening. Many students wait until it is too late to seek assistance, thinking “I’ll just do better on the next exam…” without actually figuring out how to do so. Describe how to use the registration system. Many new students don’t know how to search for certain types of classes (such as General Education). While we’ll explain how to use the system, normally we will not register you for classes – you can do so in ONE.UF yourself. Information about majors outside of CLAS – go to the advising office for the college that offers that major. Advising about major or minor requirements – go to your major/minor department (department addresses are listed at the top of each department’s section in the Schedule of Courses: http://www.registrar.ufl.edu/soc/). If a course is departmentally controlled, you must talk to the department that offers the class to see if you are eligible to register for it. If you need credit from other institutions evaluated for your major or minor, you should visit the appropriate department. The AAC can evaluate credit from other institutions that may count for General Education requirements. Please remember to bring along a course description for credits in question. If you are having trouble getting into a particular course, we don’t have the ability to place you into full classes. You may contact the department that offers the course. If your problem is a prerequisite issue, they may be able to help you. If the course is simply full, they probably can’t do anything. Learn how you can become an Ambassador of the College of Liberal Arts & Sciences.